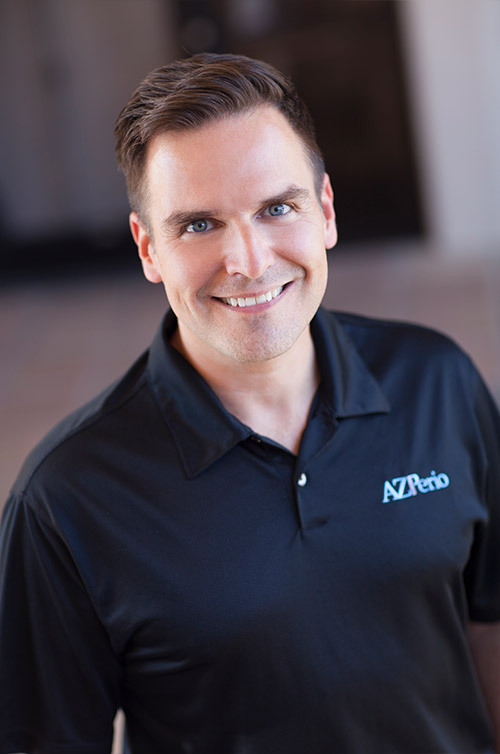 Practicing periodontics in the Valley since 2007, Dr. Dirk Donovan sees patients at the Central Phoenix and Paradise Valley offices. Inspired by his childhood dentist who exhibited a caring personality and made sure his patients felt comfortable at all times, Dr. Donovan knew early on what his life’s mission would be. He brings the same heartfelt intentions into his periodontics practice, putting patients at ease before, during and after each procedure. Dr. Donovan earned his Doctor of Dental Science from Temple University in Philadelphia and received his Master of Science in Dentistry and Certificate in Periodontics from Indiana University. He is a Diplomate of the American Board of Periodontology. Dr. Donovan began his career at a large perio-implant practice in 2004 in Chicago. He attended an education course in Phoenix in January 2007 and moved here three months later to escape the cold, gray weather in the Midwest and enjoy the Valley of the Sun. In his free time, Dr. Donovan enjoys travel, music and enjoying Arizona with his friends.